The 1/4 in. (3/8 in. O.D.) Shark Bite Push-to-Connect Tee is the easiest way to join copper, CPVC or PEX pipe in any combination with no soldering, clamps, unions or glue. Just insert the pipe and the stainless steel teeth bite down and grip tight, while a specially formulated O-ring compresses to create a perfect seal. Disassembly is just as fast using the simple disconnect tool so fittings and valves can be easily changed and reused. They can even be rotated after assembly for easier installation in tight spaces. Shark Bite Fittings are certified for potable water supply and hydronic heating applications. Get Shark Bite and get a grip on your next plumbing project. Joins Two 1 1/4 Inch Pieces of Poly Pipe to 3/4 Inch piece of Poly Pipe to form tee. NSF Approved. Safe for Potable Water. Good Chemical Resistance. Widely used in the Pool and Spa Market. Temperature Rating 73 F - Cold Water Applications. Joins Three 1 1/4 Inch Pieces of Poly Pipe together to form tee. NSF Approved. Safe for Potable Water. Good Chemical Resistance. Widely used in the Pool and Spa Market. Temperature Rating 73 F - Cold Water Applications. The SharkBite PEX Plastic Barb Tee (5-Pack) is an easy to install, low cost solution to connect PEX pipe. Advanced Polymer Plastic fittings are a perfect solution for areas where corrosion may affect DZR Brass Fittings. SharkBite PEX Plastic Barb fittings are suited for potable water distribution and hydronic heating applications. These PEX fittings may be used with the stainless steel clamp system or the copper crimp ring system (both sold separately). The SharkBite PEX Barb fitting range offers a wide variety of Fittings, Manifolds, Valves, clamp rings, crimp rings and tools in various sizes to help complete your next plumbing project. Sb Tee 1/4 Inch (3/8 Inch Od) Rt Lf The 1/4 in. (3/8 in. O.D.) 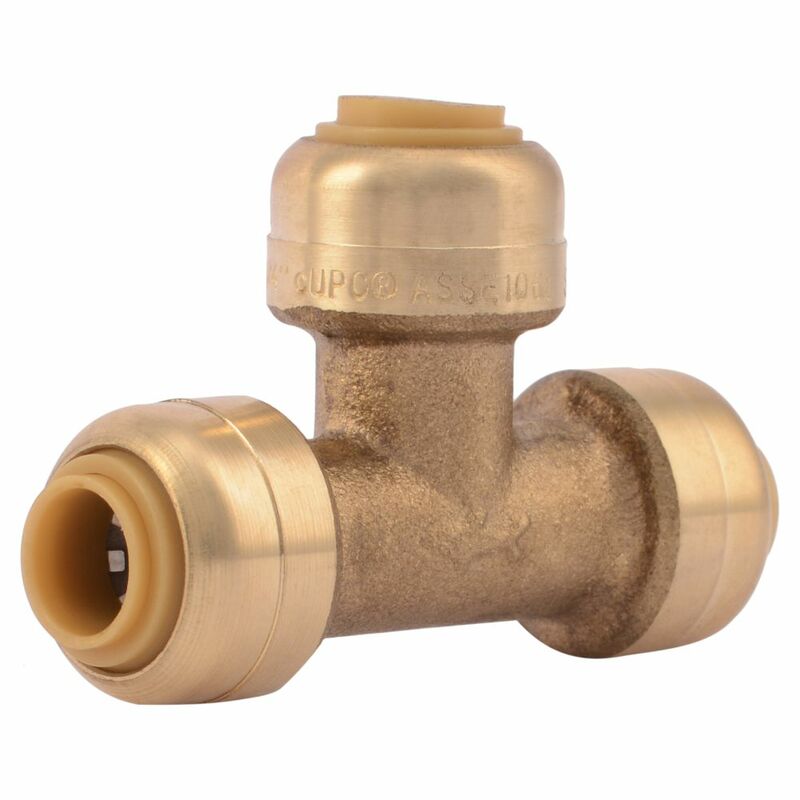 Shark Bite Push-to-Connect Tee is the easiest way to join copper, CPVC or PEX pipe in any combination with no soldering, clamps, unions or glue. Just insert the pipe and the stainless steel teeth bite down and grip tight, while a specially formulated O-ring compresses to create a perfect seal. Disassembly is just as fast using the simple disconnect tool so fittings and valves can be easily changed and reused. They can even be rotated after assembly for easier installation in tight spaces. Shark Bite Fittings are certified for potable water supply and hydronic heating applications. Get Shark Bite and get a grip on your next plumbing project.